The endless expanse of rolling planes stretching under immaculate blue skies, long farms and plantations, cork oaks- these are images that come to mind when thinking about Alentejo. Painted a deep green in late winter, sometimes straw-coloured in late spring, sometimes ochre brazier in the summer, profoundly reinvigorating and liberating it is populated by people who are relaxed and proud of their surroundings. The open plains, naturally, lend themselves to the farming of cereals, olive, cork oak and animals. The wine was here at least from the time of the Romans. From them a lot of winemaking process was inherited. Fermentation used to be done in large clay amphoras, a trend that is slowly coming back to the winemaking world. Flatness prevents condensation of moisture in most parts, apart from the very north, where Alto Alentejo meets Beiras. As a result the grapes spend most their time naked under the Sun which ripens them well, but also makes watering essential. 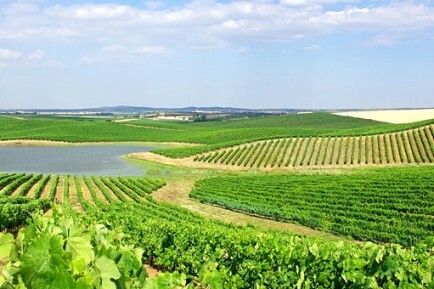 The region uses a number of traditional Portuguese grape varieties, like Trincadeira, Aragonês, Castelão, Antão Vaz and Arinto. However, more international varieties have been strongly adopted in the region, especially for blending and, for example, Alicante Bouschet is considered as native-adopted.